As a dietitian that works in healthcare, I work with a lot of patients with heart disease. Heart health is extremely important as some of the top causes of death are related to heart issues. With millions of Americans with heart disease, heart health and prevention of heart issues is so important. 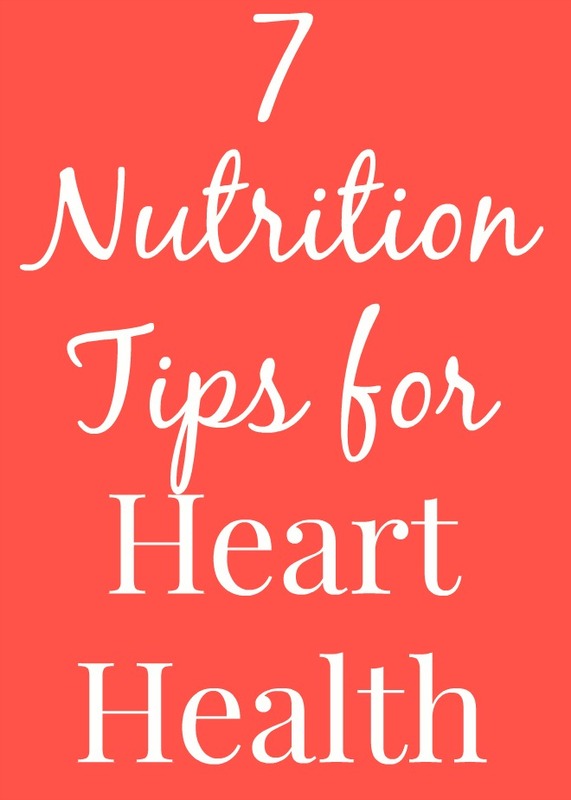 Today, I want to share some of my top nutrition tips for a healthy heart! As with nearly every disease, fresh fruits and vegetables are some of the best ways to help prevent illness. Eat a variety of produce for the best results since different fruits and vegetables have different vitamins and minerals. I aim to eat the rainbow by eating a variety of colorful produce through the week. The American Heart Association recommends at least 4.5 servings of fruits and vegetables per day. Great choices include ground flax seeds, chia seeds, fish and taking supplements with omega-3 fatty acids in them. Four days per week, I eat oatmeal with ground flax and chia seeds for a boost of omega-3 fatty acids. Fitness plays a very important role in heart health. The American Heart Association recommends at least 40 minutes of aerobic exercise three to four times a week. My favorite is walking, a bit of running and lifting weights. There is not a specific exercise that you have to do for heart health, but just focus on finding something that you enjoy and will be able to do regularly is key. I make my own pasta sauce to limit sodium! Most Americans consume more sodium each day than they could ever need. To lower blood pressure, it is recommended to keep sodium intake less than 2,400 milligrams per day. Reducing the amount even more can be more beneficial. Foods especially high in sodium are frozen meals, canned soup, soy sauce and other sauces, etc. Check labels and aim to buy low-sodium or no added salt products. Like sodium, many people consume much more added sugars than they should. Check labels to reduce added sugars- this includes sugar, brown sugar, molasses, honey, agave, brown rice syrup, etc. The American Heart Association recommends limiting added sugars to about no more than 6 teaspoons per day for women and 9 teaspoons per day for men. Boneless, skinless chicken breasts are a good source of protein while being lower in saturated fat. Try my lightened up recipe for Chicken Piccata. Limit foods high in saturated fat including high fat meats, dairy products and more. Choose skinless meat to reduce fat and look for lean cuts. Instead of food high in saturated fats, replace them with foods with monounsaturated and polyunsaturated fats that are in foods such as nuts, olive oil, fatty fish and avocado. Of course, a healthy diet and exercise are the most important parts of heart health (along with no smoking!). To help support a healthy heart, supplements can be beneficial as well. Ask your doctor or registered dietitian about specific supplements. I like taking a multivitamin and omega-3 fatty acids.